Other than the common cold, tooth decay is the most prevalent disease in the world. 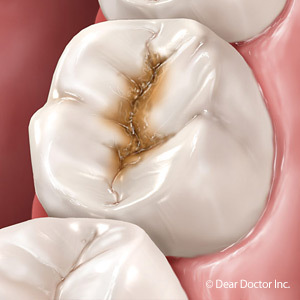 And while a cavity or two may seem like a minor matter, tooth decay’s full destructive potential is anything but trivial. Without proper prevention and treatment, tooth decay can cause pain, tooth loss and, in rare cases, even death. This common disease begins with bacteria in the mouth. Though these microscopic organisms’ presence is completely normal and at times beneficial, certain strains cause problems: they consume left over carbohydrates in the mouth like sugar and produce acid as a byproduct. The higher the levels of bacteria the higher the amount of acid, which disrupts the mouth’s normal neutral pH. This is a problem because acid is the primary enemy of enamel, the teeth’s hard protective outer shell. Acid causes enamel to lose its mineral content (de-mineralization), eventually producing cavities. Saliva neutralizes acid that arises normally after we eat, but if the levels are too high for too long this process can be overwhelmed. The longer the enamel is exposed to acid, the more it softens and dissolves. While tooth decay is a global epidemic, dental advances of the last century have made it highly preventable. The foundation for prevention is fluoride in toothpaste and effective oral hygiene — daily brushing and flossing to removing plaque, a thin film of food remnant on teeth that’s a feeding ground for bacteria, along with regular dental visits for more thorough cleaning and examination. This regular regimen should begin in infancy when teeth first appear in the mouth. For children especially, further prevention measures in the form of sealants or topical fluoride applications performed in the dentist office can provide added protection for those at higher risk. You can also help your preventive measures by limiting sugar or other carbohydrates in your family’s diet, and eating more fresh vegetables, fruit and dairy products, especially as snacks. Doing so reduces food sources for bacteria, which will lower their multiplication and subsequently the amount of acid produced. In this day and age, tooth decay isn’t a given. Keeping it at bay, though, requires a personal commitment to effective hygiene, lifestyle choices and regular dental care. Doing these things will help ensure you and your family’s teeth remain free from this all too common disease.